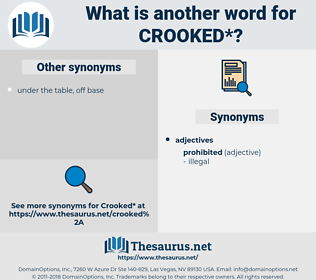 What is another word for crooked? Not straight; having angles or curves; dishonest. corrupted, lodgepole, corrupt, warped, hooked, dishonest, skewed, rotten, wacko, fucked-up, wrong, dirty, weird, distorted, tortuous, askew, spooky. twisted, bent, far-fetched, screwy, screwed-up. lawful, moral, good, honest, law-abiding, untwisted, unbent. ethical, trustworthy, principled, scrupulous, aboveboard, frank, truthful, open. 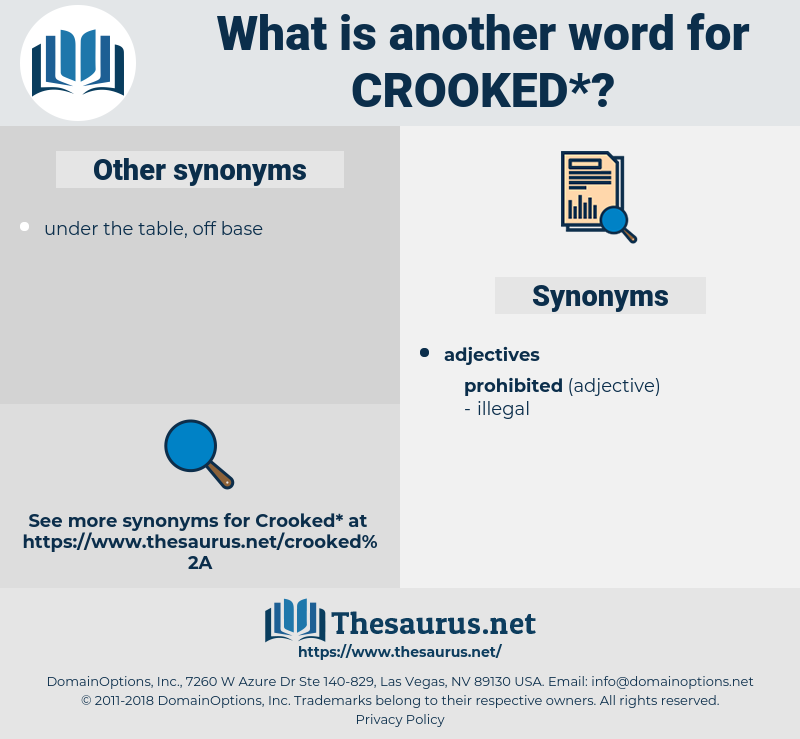 square, even, erect, uniform, valid, symmetrical, vertical, regular, ordered, legitimate, just, level, conscientious, orderly, upright, balanced, forthright. Why, Jack, he's so crooked he can't lay in bed straight. I do not think Unc Nunkie cares very much to see the famous Crooked Magician; but for my part I am curious to look at such a great man. crusty, crosscut, crosstie, church hat, charged, caraway seed, christie, corked, crush out, coruscate, crocuta, characid, crassitude, cerussite, correct, crochet, crust, crested, cricetidae, crazy weed, Cheshire Cat, corkwood, corrugate, crocket, crosshead, careerist, curiosity, crocethia, corixidae, crazyweed, crushed, charge sheet, cracked, circuit, cruciate, cricket, cork jacket, corrected, christ, crusade, creosote, crusted, cragged, crazed, crocketed, croquet, crew cut, correctitude, corrugated, crossed, cracidae, crossed eye, crest, charcot, characidae, crow-sized, carrycot, carry weight, cursed, church-state, crocked, croquette, cross-eyed, cherry-sized, cursed with, crack shot, crouched, coarctate, courgette, curst, cherished, corset, czarist, coraciidae, cryostat, car seat, crockett, cross out.